(He) Got That Glow: Daniel Kaluuya Shows Us That Fenty Makes the Fellas Flawless, Too! Daniel Kaluuya attends the 90th annual Academy Awards at Hollywood & Highland Center on March 4, 2018, in Hollywood, Calif. 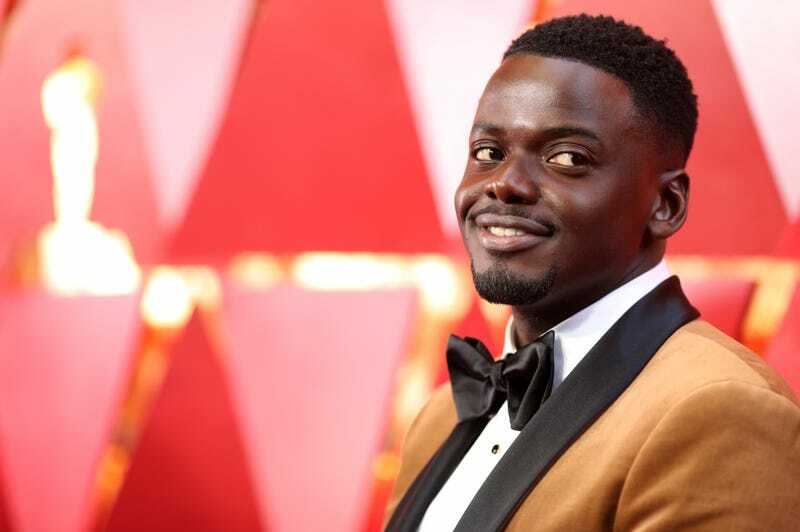 This is Daniel Kaluuya’s first time running the hectic gantlet of awards season, but we wouldn’t know it. From his bold suit choices to his beauty routine, Kaluuya has emerged a real red-carpet winner. Kaluuya quickly became one of my red-carpet faves because of his love for strong suit colors—not shying away from burgundies and interesting, unexpected textures and necklines. His Oscars outfit, styled by Mercedes Natalia, was another standout, featuring a nontraditional, caramel-colored velvet Brunello Cucinelli contrast-collar tux jacket that looked beautiful against his skin. Hello, “Posh Kenneth”—except this time, the poshness is real as all get-out. And here’s yet another reason to love you some Kaluuya: He’s a Fenty beauty fan. Thanks to his groomer, Amber Amos, Kaluuya nailed that “lit from within” glow on Oscar night that so many aspire to. And the realization that Kaluuya was rocking Fenty (the Pro Filt’r foundation in 480 and 490, to be exact) collectively blew Twitter’s mind. And then Beauty Twitter’s wigs flew to China. Because, as you might remember, Kaluuya full-on embraced director Jordan Peele following his win for Best Original Screenplay, and nary a smudge of transfer was to be found on Peele’s WHITE TUX. I’m nearly as excited watching that GIF as I was seeing Peele win, to be honest. Amos first applies a hydrating Lip & Body Treatment Balm from Paula’s Choice, then cleanses and refreshes his skin with their go-to product, Kiehl’s Oil-Free Toner, and then she lightly exfoliates Kaluuya’s complexion with Kate Sommerville’s Clinic to Go Resurfacing Peel Pads. After applying Kiehl’s Facial Fuel Eye De-Puffer, to help tighten the under eye area and get rid of any potential puffiness, Amos uses Kate Somerville’s DermalQuench Liquid Lift, which is similar to a mini oxygen facial, to push both oxygen and hyaluronic acids into his skin. “It gives a nice boost, and makes sure the skin is plump yet firm and helps lighten dryness from the California air,” she adds. It should be noted that this isn’t the first time Kaluuya has rocked Rihanna’s beloved makeup brand on the red carpet. Amos blessed his complexion with Fenty for the SAG Awards, too. And there you have it: Kaluuya, critically acclaimed actor, rising Hollywood star and, also, makeup goals.